Habit: Annual to perennial herb; hairs 0 or simple. Leaf: basal rosetted, petioled, entire to pinnately lobed; mid-cauline petioled or sessile, base lobed to sagittate or wedge-shaped. Flower: sepals erect to reflexed, bases sac-like or not; petals linear to oblanceolate, spoon-shaped, or obovate, clawed or not, white to lavender or purple; stamens free (+- fused). Fruit: silique, dehiscent, linear, unsegmented, +- narrowed between seeds, cylindric or +- flat parallel to septum, stalked above receptacle; stigma entire. Seed: 1 row per chamber, +- flat; wing generally 0. Habit: Biennial, generally glaucous. Stem: 1--7(12) dm; hairs 0 or toward base. Leaf: basal blade 2--15(25) cm, dentate to pinnately lobed (entire), withered by fruit time, petiole ciliate; mid-cauline sessile, base lobed or sagittate, entire or dentate. Inflorescence: dense. Flower: petals 6--11(14.5) mm, 0.5--0.7(1) mm wide, linear to narrowly oblanceolate, white to pale lavender, crinkled. 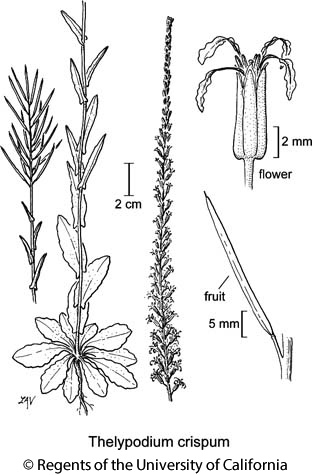 Fruit: 1--2.5(4) cm, 0.7--1(1.8) mm wide, cylindric, narrowed between seeds; stalk above receptacle 0.5--1.5(3.5) mm, slender; style 0.5--1.5(2.5) mm; pedicel erect to erect-ascending, partly or fully appressed, 2--5(10) mm, slender. Seed: 22--50, 1--1.5 mm, plump. Chromosomes: 2n=26. Citation for this treatment: Ihsan A. Al-Shehbaz 2012, Thelypodium crispum, in Jepson Flora Project (eds.) Jepson eFlora, http://ucjeps.berkeley.edu/eflora/eflora_display.php?tid=46355, accessed on April 23, 2019. SNH, GB; Markers link to CCH specimen records. Yellow markers indicate records that may provide evidence for eFlora range revision or may have georeferencing or identification issues. Purple markers indicate specimens collected from a garden, greenhouse, or other non-wild location.